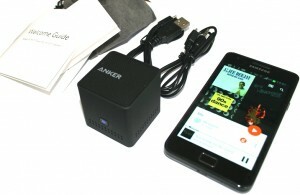 Anker Wireless Bluetooth Speaker for SmartPhones. The Anker Wireless Speaker is one of those gadgets which is a must have for anyone who’s into their music and wants to listen to their smartphone over bluetooth or a wire (where bluetooth is not available on the sending device). The Anker speaker is extremely low cost for the quality and sounds full of deep bass and stereo perfection rather than the tin sounding garble which typically comes from the smartphone speakers – despite adjust the graphic equalizer. The sound is boosted by the 3 Watt audio driver and passive subwoofer built in. 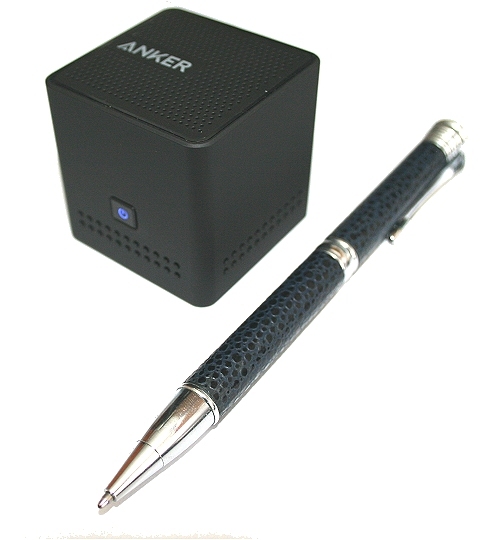 Anker’s USB power cable – this is used to plug the speaker box into a mains supply to recharge its built in lithium ion battery. A cable which connects from one end into the headphone socket of your smartphone, and the other end into the speaker box. This is for those devices which are really quite few and far between now that do not support bluetooth. A small instruction booklet is also supplied – but to be honest – the device is simplicity in itself to operate and even though I personally am not a huge owner of this type of gadget – I had it up and running in a matter of seconds – literally. Not only that – I have never even used bluetooth on my smartphone (Samsung Galaxy in this case) but it paired up in seconds and was pumping out the bass a second later. It is weighty to handle and has a good build quality, a small button on the front is back lit with an LED which indicates the various status’s of the battery and the speaker itself as it operates. For example, as the Anker speaker is pairing up, the light flashes until it is connected, then it becomes steady blue so you know its bound to the phone. To charge the battery, you would need to buy an additional USB output plug which connects to the mains power socket in your home, we already have these so only the supplied cable was needed in this case. Once fully charged, you can play music on it for around Eight hours – not only that – but at around Eighty percent of maximum volume. The package does advise that when recharging – you should not be using it. 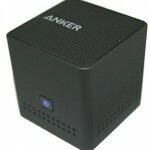 The Anker pocket bluetooth speaker also comes with an 18 months warranty. This has been a bit of a sticking point in the past for me – and here is why. A lot of gadgets now come with the battery built in and inaccessible, so when it reaches the point where it no longer accepts a charge (and the operational time of a battery reduces with use over time aswell) the entire device becomes defunct. This gets me angry on items valued in the hundreds, but at a tenner, who can complain as even if it only lasted two years, it is realistically a disposable item at that price. Maybe the components don’t outlast the battery – with it being new there is no way of telling. Basically though, consider the extreme low cost of the product before worrying about the battery life – it really isn’t an issue in this case. When looking round at various bluetooth speakers, we looked at dual kits and also the singles – this is ideal for grabbing and sticking in your car, in the bathroom (keep it dry!!) or anywhere else where you want your tunes playing. We also looked at many items which had been described as having sound problems – ie too quiet or as though there was too much treble. Not the case here – the Anker will boom out the sound at a volume, which, in a small bedroom is actually too loud and could best be described as irritating, so you get the picture – it isn’t going to fill a nightclub with ear splitting volume – but it IS going to suffice for indoor use and garden use – and it does the job superbly. Obviously you can adjust the volume and graphic equalizer parameters via the phone settings / controls. I wouldn’t want to listen to this on full blast for example when I am in the bath – it would be too loud on my ears. Now, if you are wondering how big or small this thing is, check out the image on the left! You would be forgiven for thinking something so tiny could not possibly provide the results you are looking for. We can’t praise this item enough for its functionality – it isn’t even a case of saying “good value for money” because that puts it down, as if to say “good for the price”. This is not appropriate. We would pay triple the price and still be more than happy. In summary, if you are looking for a highly portable speaker system to connect your mobile to – then get one of these and you won’t be disappointed. One more thing – the matte black finish means it can sit just about anywhere without being obtrusive or looking out of place. It fits just fine on the fireplace for example, but do beware – on full power it has a slight walk if the sound is too heavy on the bass……… so it could be worth sticking this little Anker blaster down to hold it in place! Oh and more – the range, how close does your mobile phone have to be to the box for it to operate? Well we carried it away from the phone, downstairs, and into a living room which in terms of distance was probably around 35-40 feet away and it was still working well and thats through walls and doors aswell! Vaping with the Kingo Vape Pen. Adult Colouring Books for Stress Relief and Relaxation.